This design is one chosen by the artist as a figure for the illustration of a client's family arms. The figure, shown bearing the heraldry associated with a family name is then altered slightly to ensure that each client has an individually unique illustration. Other figures of different dates are available should the client wish. The illustration is taken from an original source, the mid 14th century Hastings brass from Elsing church in Norfolk and is based on Ralph, Lord Stafford, one of the small supporting figures on the memorial. This commemorative brass is one of the acknowledged sources for armour of the early period of the Hundred Years War. Stafford wears armour of the transitional period from mail to plate with a surcoat and shield bearing his arms of 'Or a Chevron Gules'. 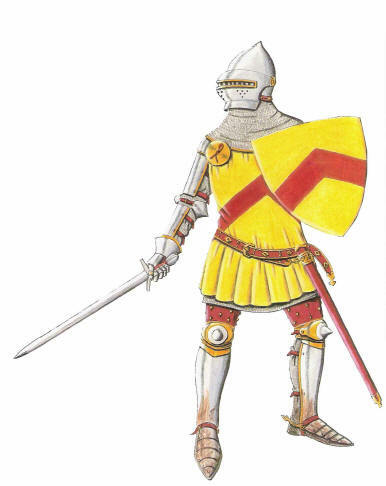 The figure is representative of those knights who fought on both sides at the battle of Crecy in 1346 and to a large degree Poitiers ten years later.